These days, pets are often treated as though they are family members, so why not pack them a briefcase of chew toys and kibble and bring them to work with you? Bringing pets to work is quickly becoming a common occurrence in offices, and it has been shown to reduce stress levels in employees and also has the added benefit of keeping our pets happy and healthy. • 16% of all working people reportedly have office pets. • The top 10 types of office pets are: Fish, dogs, cats, tortoises, birds, rabbits, guinea pigs, geckos, snakes, and tarantulas. 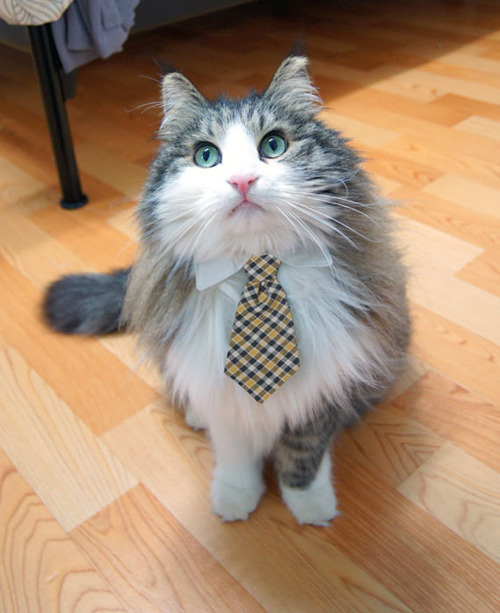 • 55% of workers admit that they would feel more motivated if they had pets at work. 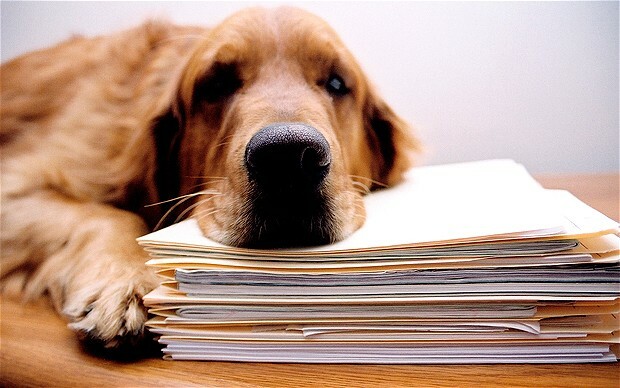 Research has shown that employers who allow dogs in the workplace saw reduced stress levels among their employees. Nearly half of those who brought their dogs to work reported an increase in their overall productivity. • 25% of workers reported that dogs positively affected their productivity. • Stress levels decreased about 11% among workers on days they brought their dogs to work. • Employees who didn't bring dogs to the work felt a 70% stress level increase by the end of the workday. Workers brought their dogs to work with them an average of 22 times in 2012, compared with 17 times in 2008. While research points to a reduction in employee stress levels, having pets—particularly dogs—in the office has additional social and health benefits (according to the Purina pet food company). • Relaxed and Inspired. Having pets in the office can keep an employee relaxed and happy, which, in turn, makes work more enjoyable. • Coworker Cooperation. Pets can help strengthen relationships through interaction between colleagues and help otherwise shy employees become more engaged in the office. • Healthy Breaks. When lunchtime rolls around, dog owners are more likely to spend their breaks walking or playing with their dogs, which can provide a mental break and lower stress. • Work-Life Balance. For many workers who consider their pets as part of their families, allowing pets at work shows employers care about their employees and the balance between professional and personal time. Before allowing pets at work, companies should enact policies regarding the pets’ behavior, considerations of employees’ allergies or fears of animals, and the overall office culture. In 2012, about 48% of UK households reported having at least one pet. This equates to 13 million households. • The UK dog population is around 8 million. • About 23% of UK households own at least one dog. • The UK cat population is around 8 million. • About 19% of UK households own at least one cat. While pets are proven to provide health benefits for their human counterparts, many pet owners are investing in pet insurance to help lower their veterinary bills and invest in their pets’ health. • Pet insurance reportedly grew to more than $500 million in 2012. What about you? How would you furnish your office to accommodate your fur-baby given the opportunity to bring him (her) to work?